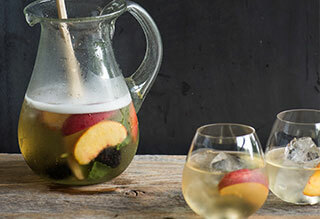 One of NC’s premiere, award winning chefs, Katie Button of Cúrate (and Nightbell) paired her recipe for White Sangria (see the recipe below!) from her Cúrate cookbook with Lou Reed’s “Perfect Day”. Stir the cognac, gin, Cointreau, simple syrup, fruit, lime wheel, and orange zest in a pitcher. Refrigerate until very cold, at least 1 hour and up to 4 hours. When ready to serve, stir in the cava. Divide among glasses and serve immediately.